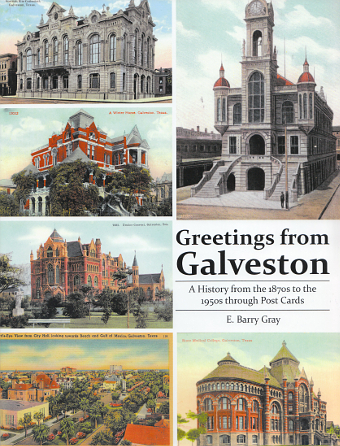 Saturday, August 13th, 2016, 2:00-4:00 p.m.
E. Barry Gray joins us Saturday with his new full color survey of Galveston history through its vintage post cards. The history of Galveston is the history of Texas. Beyond that, it is the history of the European colonization of the New World. Galveston has seen cannibalistic Indians, Spanish conquistadors, explorers, filibusters, pirates and their treasure, ship wrecks, Civil War battles, yellow fever epidemics and survived all these to become the leading city in Texas in both population and commerce during the mid and late 19th Century. Galveston had the first telegraph, first telephone, first electric lights, first medical and nursing schools in the state and the list goes on and on. At one time she had over forty millionaires living in kingly mansions of almost every style of architecture along Broadway and other avenues. Greetings from Galveston is a history of the city illustrated with color vintage postcards featuring Galveston’s Victorian streets and structural marvels by some of the greatest architects the 19th Century had to offer. The book has 111 pages with full color illustrations throughout. E. Barry Gray is a 5th generation Texan whose family was among the earliest settlers of East Texas. His great-great grandfather was Josephus S. Ervine, the youngest man to have fought in the Battle of San Jacinto. This family heritage accounts for his lifelong love of Texas history. He is a graduate of the University of Texas at Austin and taught chemistry and physics in Texas public schools for thirty four years.